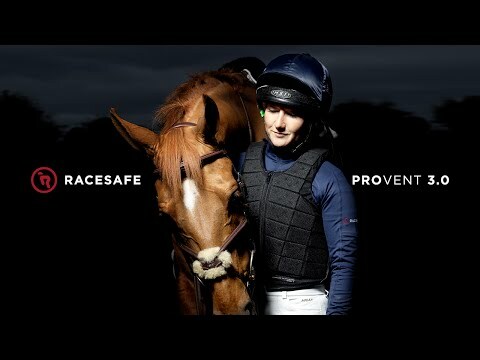 Racesafe’s latest body protector, the Racesafe PROVENT 3.0, launches a new generation of lightweight, flexible & breathable protection. Allowing riders of every level the freedom the perform. Please select the size guide to find your perfect size. Please note: Not all back lengths are in stock for immeditate delivery. Every effort is made to keep most common back lengths in stock. If you are in urgent need of your body protector please call to check stock on 01823 672071 on the PROVENT. Tall - For core sizes within the range, a longer bodied tall fit is available. Suitable where the standard size is not long enough. Front - This features a front with an extra row of blocks. For sizes Adult Large & Ex Large a shorter, shaped body is available as a Ladies Fit. Suitable where the standard size is too long in the body. Front - These feature a front with a row of blocks removed & the next row tapered to lift the side off of the hips. Back - It also features shorter back options than the standard sizes. Measure the chest size and select an appropriate STD fit size from the size chart. If towards bottom of the chest measurement range for a size, start by trying the size down. Tighten the side adjustments by pulling down on the elastic cord and sliding up the lock. At the front, the Body Protector should reach up to the breastbone and cover the bottom rib at mid chest. The front length should not restrict movement within the range of a riding position. The body protector should sit off the hips at the side with a neat fit over the shoulders. Check the back length by sitting on a saddle and ensure the Body Protector does not hit the saddle or impede movement. There should be approximately a hands width between the saddle and the bottom of the Body Protector. It should be possible to lean back in a balanced position without the bottom of the body protector catching the saddle. Or measure the required back length from the prominent C7 vertebra at the base of the neck down to where the body protector should finish. Refer to the size chart to choose correct back option for that size. The size suggested by the size chart based on the chest measurement is loose? If towards bottom of the chest measurement range for a size, start by trying the size down. There is an overlap between a number of the sizes within the range of adjustment. The bottom row of foam doesn’t cover my bottom rib. Try the Tall fit of the size if available. This has one extra row of front foam compared to the standard size. A full row added to the front. Suitable where the full row width is required & the extra length will not cause the body protector to sit on the hips at the side & push up. A tapered/angled row added. Suitable where the extra length is required to cover the ribs at the front but a reduced width at the side prevents the body protector sitting on the hips and pushing up. This is a more common adjustment. The body protector is sitting up off the shoulders. This is usually a result of the body protector being too long in the body and/or back. Firstly, check that the size down is not a better fit. Check that it is the standard fit rather than the tall fit being tried. For sizes Large & Ex Large, try the Ladies Fit option. Check the back is the correct length. A back too long can catch and generally push the body protector up, preventing a neat fit over the shoulders. A full row removed from the front. Suitable where the removal of the full width will still allow the ribs to be covered. Tapering of the bottom row. Suitable where the removal of a whole row would expose the ribs. Angling the front row up off the hips, helping the body protector sit down neatly. This is a more common adjustment. Is there an exact length the back should be? The exact back length is a personal preference. The ideal balance is long enough to offer protection without becoming too long as to restrict movement or catch the saddle. The correct length will depend on factors such as the depth of the saddle seat and the range of movement required by each discipline. "brilliant fitting service, great product can't recommend highly enough"
"Amazing body protector !!! " "Fab fitting body protector, so comfortable you dont know you are wearing it. Definately worth the money"
"I tried this on at my local shop but they didn't have a short tailed one in stock and it would have taken 2-3 weeks to order. But Wychanger got it to me within 24 hours and even phoned me to check the size;a very friendly and helpful service. Also the body protector is comfortable and I feel safe in it."